The singer will take to the stage while also performing best man duties as his father's nuptials, The Sun reports. Robbie's father, club singer Pete Conway, who is marrying Melanie Mills, performed at the Take That star's wedding to Ayda Field in Los Angeles in 2010. 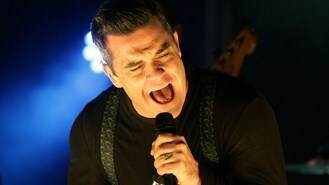 A source told the newspaper: "Robbie is thrilled - he is best man and will sing. There's talk he will do the first dance, maybe something during the ceremony too." New dad Robbie recently announced a European stadium tour - to seal his place "in pop history". The Candy singer will be supported by Olly Murs during the gigs.